Let's imagine that you and a friend could converse on the planet Venus — without having to worry about the lack of oxygen, crushing pressure, and beyond boiling temperatures. Your friend would sound so different that you'd actually see her differently. That's one of the more intriguing conclusions from a team led by the University of Southampton's Professor Tim Leighton, who have calculated all the different sounds we might hear if we could listen in on the other worlds of our solar system. That includes the whirlwinds of Mars, the lightning of Venus, and even the sounds of methane and ethane falling like water on Saturn's moon Titan. "We are confident of our calculations; we have been rigorous in our use of physics taking into account atmospheres, pressure and fluid dynamics. 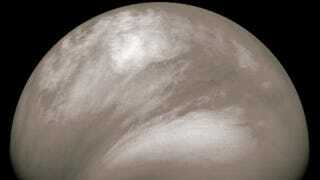 On Venus, the pitch of your voice would become much deeper. That is because the planet's dense atmosphere means that the vocal cords vibrate more slowly through this 'gassy soup'. "However, the speed of sound in the atmosphere on Venus is much faster than it is on Earth, and this tricks the way our brain interprets the size of a speaker (presumably an evolutionary trait that allowed our ancestors to work out whether an animal call in the night was something that was small enough to eat or so big as to be dangerous). When we hear a voice from Venus, we think the speaker is small, but with a deep bass voice. On Venus, humans sound like bass Smurfs." Via the University of Southampton. Image via NASA.